This is the most prestigious regatta of the Mediterranean, part of the Rolex series, held annually since 1953, from Saint-Tropez (France) – Genoa (Italy). 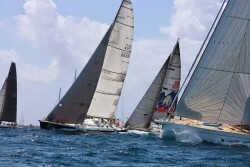 The offshore racing actually starts in Sanremo with a 60 nm race over night to St. Tropez. This is followed by 3 days of offshore racing around marks from St. Tropez before the 243 nm race to Genoa which involves rounding the rock to the north of Corsica before heading to the finish in Genoa. The race is for classes: IRC, ORC, Mini Maxi Racing, Mini, Maxi cruise. Every year, the regatta has up to 220 yachts competing from 30ft. – 90ft. The awards ceremony is held in the Fortress of San Remo and Saint-Tropez. The winners in addition to cups and medals, also receive a Rolex watch.